Tonight the Seoul Players held a special benefit performance of Ben Elton's Silly Cow in aid of Matt Robinson and his ongoing hospital saga. 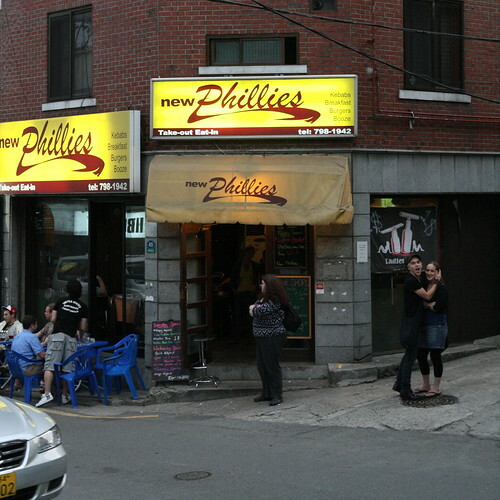 A few friends and I managed to squeeze ourselves into the sold out showing in the basement of Phillies in Haebangchon and were treated to a romping rendition of Elton's 90's farce. Desiree Munro as Doris Wallace the "Queen of Catty" stole the show with her vindictive, pink champagne guzzling, sleazy journalist who seemed to be channeling a combination of Rik Mayall and Fran from Black Books. Originally the role was written for Dawn French, but Desiree managed to bring her own style to the part and was very entertaining. Gef Somervell deserves mention for his performance as a whiskey sozzled newspaper editor and Lance Noe held his own as Douglas, a seemingly mild mannered accountant with a strange affection for postmen. Angel Campey did well as the dowdy Peggy and Keith Power showed off his sleazy skills as Eduardo the 21 year old toy boy. Farce is always tricky to perform and the Seoul Players must be commended for their hard work and efforts. The strangest thing for me was that some of the script had been updated, yet other references remained firmly in the nineties; so that comments about Hannah Montana, came amongst jokes about Sarah Ferguson and mentions of Alan Bleasdale. It's great to see the expat community come together to support theatre and also help out a comrade in need and I look forward to the Seoul Player's future exploits. Silly Cow runs until Saturday 13th June and you can also help Matt by attending the "Dance For Matt" fundraiser this weekend.